Here's a story about the Titanic you may have never heard before ... strange as it seems, a mysterious writer wrote a detailed account of the tragedy ... 14 years before it happened! They forgot that book that predicted the Titanic would sink. I think in the book the boat was called the Titan and was owned by the White Star Line and was sailing on it's maiden voyage to New York when it hit an ice berg and sank. The author pretty much nailed that one. The Titan disconcertingly resembled the famous ocean liner Titanic. Morgan Robertson was an American merchant marine officer, he was also a writer and credited by some as the inventor of the periscope. But he is more popularly known as the man who in 1898, wrote a novel called “The Wreck of the Titan or Futility”, in which a liner called Titan sank in the Atlantic Ocean after colliding with an iceberg. It is a story that few have actually heard of, fewer have actually read the book, that according to many, anticipated the sinking of the “unsinkable” Titanic. This novel tells the story of a “unsinkable” Ship, the largest and most luxurious ever built, and its passengers were the most distinguished members of the world bourgeoisie. It was described as an unsinkable ship, but was destined to never reach its destination, as the Titan would crack open after colliding with an iceberg and sinking, leaving only a few survivors. The cruise existed only on paper, in the imagination of the novelist Morgan Robertson, or so it seemed. In addition to the similarities between the names of the ships, the dates and time of the accident, the “Titan” by Robertson, was a ship that also belonged to an English company just like the Titanic did. Also, incredible similarities can be seen in the design of the ships, the number of engines and masts liners, which had a nearly identical length and a nearly identical power, and struck the fatal iceberg at a nearly identical speed. The small number of lifeboats in relation to the number of people traveling on boats is another similar fact, though Robertson could not predict the death toll, which stood at 3,000, double that of the actual. *Both of the ships were triple screw (propeller) ships. 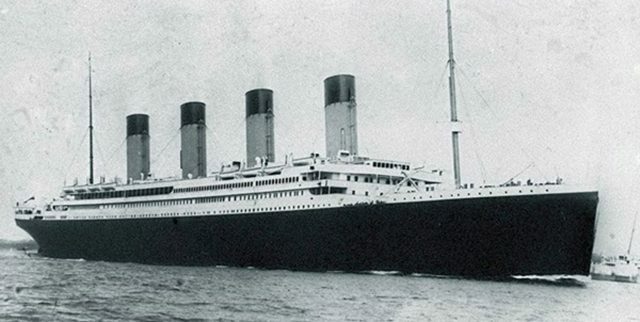 The Titanic carried 16 lifeboats, plus 4 Engelhardt folding lifeboats, which was less than the required for the crew and passenger capacity of 3000. According to the book, the Titan carried “as few as the law allowed”, 24 lifeboats, which could carry less than half of her total complement of 3000. The titanic struck the iceberg moving at 22½ knots on the starboard side on the night of April 14, 1912, in the North Atlantic, 400 nautical miles (740 km; 460 mi) away from Newfoundland. The titan also struck an iceberg moving at 25 knots, curiously also on the starboard side on an April night in the North Atlantic, 400 nautical miles (740 km; 460 mi) from Newfoundland. *Both ships sank, even though they were described as unsinkable. The Titanic sank, and more than half of her 2200 passengers and crew died. The Titan also sank, and more than half of her 2500 passengers drowned. The Titan and the Titanic were both 400 miles from Newfoundland! Creepy or what? Well its a true story. This animation was created to go along with the 104th Titanic sinking anniversary podcast we held on April 14th, 2016. You can listen to the recording of that podcast (nearly 4 hours long) along with this video to get additional minute-by-minute, in-depth information on the sinking. Go to - www.titanichg.com/archives/ - play the podcast at the top of the page, then play this video at the point in the podcast we say to play, and the podcast will be synced with the animation. This is our full-length animation of the Titanic sinking, beginning with the iceberg collision and ending with its disappearance. The point of collision is at 1:06. This is a complete animation; not a short animation that was slowed down to match real time. This is also highly accurate, though we have already documented improvements we plan to make for the final game. The animation includes text frequently appearing with what is happening on board the ship. This includes visuals of various interior rooms flooding, lifeboats launching, rockets firing, and the Californian on the horizon. The animation was created in Unreal Engine 4. The exterior model used is not our final model, but an older model created by one of our team members. 1:05 - Titanic collides with iceberg. 6:06 - The ship has stopped as damage inspections are carried out. 7:44 - Captain Smith orders engines to 'Half Ahead'. 19:41 - Titanic stops for the last time. 20:04 - Excess steam is vented. 38:08 - The Titanic begins taking on a 'starboard list'. 43:03 - Thomas Andrews estimates 1-2 hours before the ship sinks. 46:23 - The first distress calls are sent out. 48:38 - Lights of another ship are spotted on the horizon. 53:07 - Most lifeboats are prepared to evacuate passengers. 58:20 - Carpathia responds to Titanic's distress calls. 1:01:29 - Lifeboat 7 is launched. 1:05:03 - Lifeboat 5 is launched. 1:05:21 - The D-Deck gangway doors are opened. 1:06:04 - The telegraph operators begin using 'SOS'. 1:07:22 - Lifeboat 5 encounters lowering difficulties. 1:08:02 - Officer Boxhall launches the first distress rocket in an attempt to signal the ship on the horizon. 1:10:24 - The Carpathia confirms it is on it's way. 1:11:03 - Steam stops venting from the funnels. 1:13:20 - The starboard list is eliminated as Boiler Room 5 floods. 1:21:28 - Lifeboat 8 leaves. 1:28:22 - Suction pumps are activated. 1:31:33 - Lifeboat 6 is launched. 1:36:57 - Water is up to the Titanic's nameplate. 1:39:37 - Titanic begins listing to port. 1:41:43 - Lifeboat 16 is launched. 1:46:54 - Lifeboat 14 is launched. 1:51:18 - Lifeboat 14 is dropped 4 feet into the sea from its falls after they jammed. 1:51:42 - Lifeboat 12 is launched. 1:52:29 - Lifeboat 9 is launched. 1:58:53 - Lifeboat 11 is launched. 2:00:41 - Lifeboat 13 is launched. 2:05:21 - Lifeboat 13 is pushed aft by the discharging condenser, jamming it on the falls. 2:05:42 - Lifeboat 13 cannot release itself as Lifeboat 15 comes down on top of it. 2:07:07 - Lifeboat 13 is released and is pulled out from underneath Lifeboat 15 as 15 lands in the water. 2:07:38 - Lifeboat 2 is launched. 2:09:31 - The lights on the horizon disappear. 2:22:12 - It is now 2AM. The Titanic has 20 minutes left. 2:26:10 - Collapsible Boat D is launched. 2:29:39 - The last messages from the Titanic are heard. 2:30:46 - Collapsible A is slid off the Officers' Quarters roof. 2:31:03 - The Wireless Room is abandoned. 2:31:42 - Collapsible B is thrown from the roof of the office quarters. It lands upside down in the water. 2:34:01 - Survivors distinctly hear 4 explosions from deep within the ship. 2:39:23 - All remaining power is lost. The ship breaks in two. 2:40:36 - Titanic is gone. Rescuers do not arrive for another hour and 40 minutes. 2:40:51 - Titanic is heard below the surface as it breaks apart, implodes and falls to the sea floor. Can people be so cold blooded as to sink a passenger ship for political reasons. The Lusitania achieved fame for being sunk with high loss of life. It is known that the ship was carrying ammunition and may have been armed as an auxiallary cruiser a war ship. It also carried military personnel as passengers. A U boat was known to be in the area where the ship was sunk as it approached Britain Yet anti sub patrols were pulled into port opening the way for the U boat to sink the Lusitania Hit with one torpedo which exploded on the side of the ship a larger secondary explosion happened that sank the ship. the cause of the larger explosion is hotly debated. some feel it was the ammuntion the ship was hauling that exploded. Others feel it was coal dust WAs the ship armed as a warship. Divers explored the wreak of the shop in a highly advertised event and found that something had be recently removed from the ship just prior to the dive but no one knew what was removed or by whom. Perhaps the Brits removed the guns that would have made the ship a legal target as a warship. it was common in that era to arm large ships such a liners to make them improvised warships. Just prior the sinking of the ship Churchill who held high office at the time made an odd statement that some times it was necessary to allow a disaster to bring a strong ally into the fight with Germany. Not an exact quote but to that effect. Ship may have been set up to be sunk as a political ploy to bring the Us into the war. The innocent pawns were considered expendable for the greater good. There are many supposedly haunted places in this world, and most of us may think that these spectral forces gravitate towards dilapidated old houses or scary forests in the middle of nowhere. We have this image of what haunted should be, and most often it all comes down to a place or thing with a tragic history and death orbiting it, through whatever means producing these alleged haunted phenomena. The seas also have plenty of this, and there is perhaps no greater tragedy on the ocean than the deadly sinking of the now infamous Titanic. Here thousands of people died a horrible death, and it should go without saying that this doomed vessel has generated its fair share of strange phenomena over the decades. When this behemoth of a ship departed on April 10, 1912, under the command of a Captain Edward Smith, it was to much joyous fanfare and publicity. The Titanic departed with over 2,200 passengers, many of them some of the wealthiest people in the world, and others were emigrants from all over Europe eager to go off to start a new life in the faraway, promised land of the United States. It was a truly historic event, demanding attention, and at the time no one would have thought anything of the fact that despite its advanced safety features it was woefully short of lifeboats, with only enough to carry around 1,178 people under ideal conditions. After all, the lifeboats were just a formality, right? Surely nothing could ever sink the mighty Titanic. Or so they thought, and the rest is history. On April 14, 1912, the Titanic was making its way through the Atlantic at high speed around 375 miles from the coast of Newfoundland in the early hours of morning when it struck an iceberg that promptly robbed the ship of its popular title of “unsinkable.” Many of the watertight compartments that had been hailed as groundbreaking technology immediately were smashed wide open, and the crippled giant began to sink at a steady rate. In the ensuing panic and chaos, the problem of the lifeboat shortage became painfully apparent, and many of these had the added problem that they were difficult and time consuming to launch. Indeed, many of the scant lifeboats went out into the frigid seas only partially loaded, leaving others to their impending doom. Eventually the gargantuan ship broke apart and plunged down below the waves with an estimated approximately 1,500 people still aboard. When the another ship called the RMS Carpathia came to the ship’s aid, it was able to rescue around 700 of the survivors, with the rest disappearing down into a watery grave to rest at the bottom down in nearly 13,000 feet of water, where the ship remains to this day. Indeed, for decades the exact location of the wreck remained a mystery in and of itself, with it not being discovered until 1985. The sinking of the RMS Titanic is one of the worst, most tragic maritime disasters in history, and at the time it shocked the world. Since that fateful morning, the Titanic has gone on to become one of the most famous ships to ever ride the seas, and has been the subject of countless films, books, and documentaries. It is by far one of the most well-known wrecks in the world, and it is perhaps no surprise that it has drawn its fair share of tales of the paranormal as well. She was the largest craft afloat and the greatest of the works of men. In her construction and maintenance were involved every science, profession, and trade known to civilization. He was someone who wrote about maritime affairs. He was an experienced seaman, and he saw ships as getting very large and the possible danger that one of these behemoths would hit an iceberg. Whether Robertson was really psychic or not is unknown, but what is known is that this is just the beginning of the weirdness surrounding the Titanic. Considering the sheer loss of life and the traumatic circumstances of the disaster, along with the fact that hundreds of these bodies were never recovered and remained lost at sea, it is perhaps no surprise at all that the very wreck of the Titanic is said to be haunted. There have been numerous reports of ships passing the area of the Titanic’s resting place off Newfoundland seeing glowing or flickering orbs of light both above the water and darting about beneath the waves. This phenomenon is reportedly often accompanied by inexplicable radio interference, and even submarines passing the area of the wreck have apparently had such interference, as well as phantom SOS signals that seem to come from nowhere. One ship that was passing the site of the wreck even had a sighting of a ghostly apparition said to be a victim of the RMS Titanic. In 1977, the liner SS Winterhaven was passing through and on this evening Second Office Leonard Bishop was showing a passenger around the ship who seemed to be absolutely obsessed with every detail of the vessel. As the tour went on, Bishop noticed that besides this intense interest in his ship there was something off about the quiet, soft-spoken man he was guiding around, but he wasn’t sure what at the time. After the tour, he did not remember seeing the man again, but the strange aura of something not quite right made him memorable, and Bishop would not forget the mysterious stranger’s face. It would not be until years later when Bishop by chance saw a picture and claimed to know the man in it, much to the shock of the person who had showed it to him. It turned out that unbeknownst to Bishop the picture was of Captain Edward John Smith, the captain of the Titanic, who would have been long dead during their tour. The ghost of Titanic captain Edward Smith actually seems to get around, as he has been reportedly seen from time to time on other vessels passing the area of wreck as well, and he is even said to haunt his childhood home in Stoke-on-Trent, in Staffordshire, England. The previous house owners, Neil and Louise Bonner, rented the house out for over a decade, and they say that there had been numerous reports from tenants over the years of paranormal activity at the house. Banging, whispers, and other anomalous noises were common, as well as roving colds spots, inexplicable floods in the kitchen, and most shocking of all a full-bodied spectral apparition of Smith himself seen in the bedroom. In addition to the hauntings of the wreck site and the home of the Titanic’s captain are the numerous hauntings that seem to revolve around artifacts and relics from the wreck, and museum collections with such items tend to be magnets for inexplicable ghostly activity. One of the more active of these is the “Titanic: The Artifact Exhibition,” at The Luxor Hotel and Casino in Las Vegas, Nevada, which houses a large array of over 300 items from the sunken ship and is ground zero for a whole plethora of unexplained phenomena. Visitors and staff alike supposedly frequently report strong feelings of being watched or followed, as well as disembodied voices or footsteps, or being poked, prodded, or pushed by unseen hands, in addition to sightings of shadowy apparitions lurking in the halls and corridors. The attraction’s artifact expert Joe Zimmer seems to be particularly tormented by these wayward spirits, claiming that he constantly experiences having his hair or clothes yanked on or his name whispered when no one is there, and he says he has even heard phantom music playing. One of the more well-known of the apparitions of the Luxor exhibit is apparently the ghost of Frederick Fleet, who was the lookout on the RMS Titanic who had spotted the iceberg that sank the ship and had warned the crew. Although Fleet was one of the survivors of the tragedy, he would forever have feelings of guilt afterwards, and this plus the death of his wife in 1964 drove him to commit suicide by hanging himself at his home in England. Fleet’s spirit has been reported as haunting the Promenade Deck of the exhibition, although why this ghost should appear all the way over in Las Vegas remains unclear. There is also the apparition of a young woman in a black old-fashioned dress and with her hair in a bun who is regularly seen on the premises. One strange incident with a ghost allegedly happened on the very opening day of the exhibition, when a photographer was getting ready for the event. He claims that as he was setting up he was surprised to see a woman in period clothes come walking down the grand staircase, which was odd because as far as he knew, no one else was supposed to be there and he had not seen anyone else arrive. Thinking that perhaps it was an extra dressed up in period clothing for the purpose of the grand opening he asked her if he could take her photo on the staircase, but she did not say a word, merely standing there in an apparent trance before vanishing into thin air. Some of the strange incidents at the Titanic: The Artifact Exhibition have apparently been caught on film and audio as well. One example is a strange sequence of events concerning a photo of Bruce Ismay, who was the chairman and managing director of the White Star Line. One morning the staff opened the exhibition to find the photo inexplicably lying on the floor of the entryway and carefully propped against the wall, reportedly still pristine and undamaged. Baffled by how the photo could have possible gotten there during the night, surveillance footage was reviewed, which showed the photo appearing to shake on its own before being taken down and put against the wall as if by unseen hands. Paranormal investigators to the exhibit have captured orbs of light and shadowy images as well, and there have been several EVP recordings made of what appear to be the voices of Titanic victims. It just makes sense that, especially with the Titanic exhibit, there would be residual paranormal energy. When you have a strong emotional imprint, there could be some energy attached. You can soon own one of the scariest souvenirs related to the sinking of the Titanic. An auction house in England is offering a mirror once owned by the captain of the fatal ship and its previous owners swear he shows his face in it every year on the anniversary of the disaster. Is it worth the £10,000 ($13,109) asking price? Will they be playing that annoying theme song during the bidding? The mirror will be up for bids on December 12th at the Richard Winterton Auctioneers’ Fine & Decorative Arts Sale (click on link to see photos) at The Lichfield Auction Centre in Staffordshire, the home county of the heroic Captain Edward John Smith, who went down with the Titanic on April 14, 1912. Fortunately, the silver-framed easel mirror didn’t because it was back home on his dressing table. Robert Williams Daniel, a passenger who survived the sinking, described the last moments of the captain. Some time after the disaster, Captain Smith’s possessions were divided up. His housekeeper, Ethelwynne, was allowed to choose something to remember him by … which would also be her last paycheck. Although it was already worth quite a bit at the time, Ethelwynne’s sister-in-law Hilda, explained in a letter (which is included in the sale) why she may have kept it. If you miss out on the auction, there are other places to see the ghost of Captain Edward John Smith. Crews of ships sailing in the area where the Titanic sank have reported seeing the captain on their own boat. He has also been spotted at his childhood home in Stoke-on-Trent, Staffordshire, where tenants who have rented it report hearing banging and whispers, feeling cold spots and seeing the ghost of the captain in the bedroom. While the mirror comes with no guaranteed that the new owner will see the ghost of Captain Smith, they’ll only have to wait a few months to find out. If the captain is like me, he may go into hiding if they decide to play that song while watching for him.